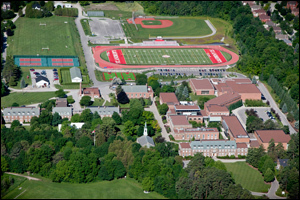 Founded in 1899, St. Andrew's College is one of Canada's oldest all-boys boarding and day schools and is located on 125 acres just north of Toronto. Its student population of 650 boys is split between boarders, representing 24 countries worldwide, and local day boys. Students choose from a wide range of electives and Advanced Placement (AP) courses; 74 rep. and house league teams across 21 sports; high calibre arts, drama and music programs; and endless leadership opportunities. St. Andrew's embodies its mission statement: "the development of the complete man, the well-rounded citizen." SAC graduates attend some of the finest universities throughout Canada, the United States, and the world. Boys from St. Andrew's are known for their strong values, lifelong friendships, dedication to community, and lasting achievements. Come and experience SAC for yourself by contacting the Admission team to schedule a visit.